As whole-roasted crickets gain traction as a protein-rich snack and restaurants experiment with mealworms on the menu, there's still "an overwhelming lack of knowledge" concerning the ecological sustainability of the emerging, multi-million-dollar insects-as-food industry, say researchers at the Swedish University of Agricultural Sciences. In an opinion article published January 14 in the journal Trends in Ecology & Evolution, they explore unanswered questions around insect rearing, safety, and environmental impacts but overall are optimistic that suppliers will rise to the challenge. "As the global demand for protein grows, insect mass-rearing can play an important role in the future of food," says first author Åsa Berggren, a conservation biologist at the Swedish University of Agricultural Sciences. "We know that we can't keep doing what we're doing in terms of producing food and utilizing the land." 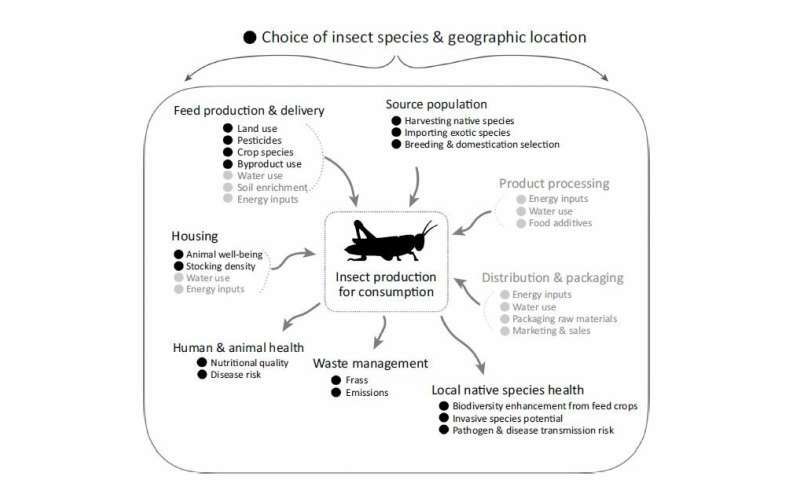 While insects-as-food provides environmental sustainability potential due to their nutritional qualities and feed conversion ratios, Berggren and her colleagues, Anna Jansson and Matthew Low, note that there are many basic questions that need to be urgently researched before the industry grows to ensure sustainability. "Otherwise, we risk replacing one environmental issue with another," says Berggren. "Though the industry is in its infancy, some companies are getting bigger, and doing well, and the risks will come along with that." Of the several areas where research is needed, one of the more urgent ones deals with unwanted systems products. For example, we don't yet know the full impact of mass-rearing insects in countries where these species do not naturally occur. An escapee could wreak havoc on the ecosystem and be akin to what Berggren describes as a "climate catastrophe." Other areas include species and life history trade-offs, sustainable feed production, food safety, and ethics. But since the industry is so young—Americans spent $55 million on edible insects in 2017—and it will take time to make insect-rich food attractive to a wider Western audience, the researchers believe there is still time to conduct proper research and shape environmental policy. "Insects have the potential to be a good, sustainable, useful food source, but it's not as simple as rearing them and then that's it," says Berggren. "There is a lot of effort that needs to be put in to research." Such philosophical issues aside, you could call them 'land prawns' or 'land scampi'. The cattle people are gonna have a fit.